You will love the smell that this dish creates. It fills up the home with such deliciousness. 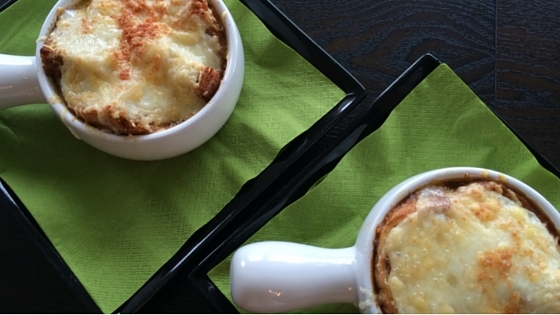 Using no sodium added organic vegetable broth makes this a healthier option than the traditional French Onion Soup. This soup is bursting with flavors and doesn’t need all the extra salt. I’ve added fresh thyme and sage to this recipe to replace the salt and give it my own unique flavor enhancer. In a large soup pot, over medium-high heat, melt the coconut oil. Add the onions, whole sprigs of thyme, sea salt, pepper, and fresh sage. Sauté the onions until they start to turn a golden brown. During the cooking process, slowly add in white wine, a few splashes at a time. This will add amazing flavor and keep the onions from sticking. It will take approximately 25 to 30 minutes for the onions to brown. Once the onions have browned, remove the sprigs of thyme, and slowly add the vegetable broth, water and bay leaves. Bring to a boil, reduce heat to low and cook uncovered for 30 to 40 minutes. It needs this amount of time to enhance the flavors. Taste the soup and add sea salt and pepper if needed. Discard bay leaves. Turn on oven broiler to 425 F. Pour soup into individual, ovenproof bowls. Toast the bread before placing it on top of each filled soup bowl. Sprinkle each with grated cheese. Place bowls on a cookie sheet to make it easy to transport and place in oven. 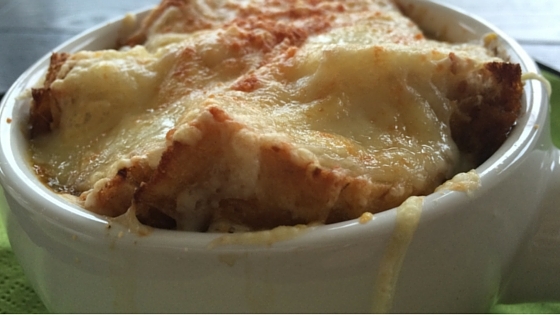 Broil the soup until the cheese has melted and is a golden brown. Remove from the oven and enjoy. Flavor Enhancer: If you have an open bottle of red wine, add a few splashes while cooking the onions. Mixed with the white wine, this gives it an amazing flavor. You can also use brandy. The alcohol will evaporate during cooking.